Hi there, a good friend recently gave me some coins from her deceased father's collection, this was among them and it has me totally stumped. I've seen many hundreds of these Toronto School Board 4 years good conduct medals and have all the official versions of it except the official PW Ellis version, I was outbid at the last second on ebay last time I saw one there. This is stamped PW Ellis but its completely unlike the official version by PW Ellis I've seen or any other one. Its not just the small details but major design elements that are different. Its the same size as the usual versions of these medals. The friend who gave it to me has no information on it at all. I have a couple of theories about it, the one I prefer is that its a design test by PW Ellis, the other is that its a counterfeit but I couldn't figure out why anyone would bother counterfeiting such a thing and then get it so visibly "wrong". I also couldn't figure out why PW Ellis wouldn't have done their design test on paper. It appears to have been struck at least twice, as you'll see some design elements are fairly crude while others are quite refined, there's also a couple of die cracks in it. If anyone could help me identify this I'd greatly appreciate it, thanks! 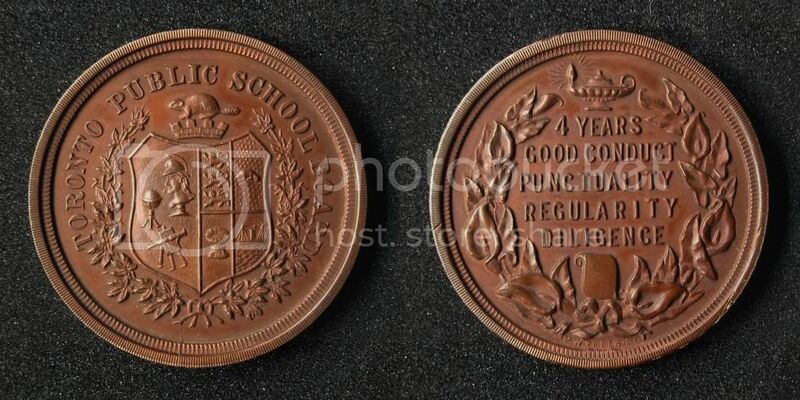 Well I just checked out the Toronto Archives site while looking for a history page on the Toronto School Board and it looks like this was an official 4 year medal by PW Ellis who produced them between 1889 and 1902, possibly alongside McKendry which they have listed as either starting to make them in 1914 or making them between 1899 and 1914 but considering Lackie is listed as making the most common of these medals and they're listed as making them from between 1914 and 1973 it seems more likely to me that McKendry produced them between 1902 and 1914 but judging by the varied dates and information on the Toronto Archives site all such information is likely approximate at best. But considering all later version follow the second PW Ellis design and there are also two PW Ellis versions of the 8 year silver version, one with the same obverse as this one but a different reverse and one with the more common design on both sides it seems likely that this one is the original PW Ellis design since according to another page I've seen, The Toronto Museum Project, the silver 8 year versions started after the 4 year versions plus the design only changed in minor details after the more common version of the PW Ellis design. I had never even considered checking the Toronto Archives online site before but they have basic info on a huge range of medals and tokens though their info is a little off at times, for instance they often report the manufacturer as "unknown" but mention the manufacturers name stamped on the medal. I'm guessing it was just quick basic cataloging work. At least now I know what exactly this is! There's also far more varieties of these medals than I had ever guessed, the rarest seems to be a one sided 1936 coronation version plus various holders. I could've sworn the most common ones were made by Wellings, something about the finish on them just screamed Wellings at me but apparently they were all made by Lackie after 1914 if the information on the Toronto Archives site is correct, and it may not be. I like this token. Good condition. Small die crack under the ribbon.